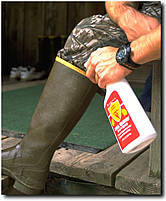 Always tuck your pants into your boots, which should be rubber since they naturally emit the least amount of odor. If you must use leather, though, be sure to smother them with cover scent and odor neutralizer. Skin naturally emits scent, so cover as much of it as possible. A popular option is to use charcoal-laced apparel that helps lock in odor. Do not smoke or chew tobacco, if possible. Their smells linger on teeth and get into clothing. Brush your teeth with baking soda to eradicate as much odor as possible. Try to avoid contact with as many things as possible when in the woods. Even the slightest brush with a branch or leaf can deposit your scent there for animals to discover hours later. If there is undergrowth blocking your path, use the equipment you are carrying to push it aside – either a bow, gun or some other piece of gear. Once they've been washed, cover everything you intend to bring with you, gear included, with an odor neutralizer. (Commonly forgotten items include boots, both the insides and outsides, tree stands, backpacks and weapons.) Pack all of the clothes in big plastic bags and seal them so unwanted scents don't attach themselves to your clothes before the hunt. Regularly check the direction of the wind. Subtle shifts or swirling wind patterns can betray your position and alert animals to your presence. Dangling a string from the tip of your rifle or bow is a good idea, but store-bought items like Smoke Stack or Wind Floaters work as well.